For National Football Authority, we discuss the Carolina Panthers’ 28-13 win over the Houston Texans on Sunday. We discuss Cam Newton’s strong play, T.J. Yates’ mistakes, the Panthers’ perfectly executed trick play, the backup breakout of Panthers LB Jordan Senn, and more. Click here to read all about it. For National Football Authority, we analyze the Carolina Panthers/Miami Dolphins preseason game, which the Dolphins won 20-10. We focus on the star turn for Dolphins RB Reggie Bush and the sputtering first start for Panthers rookie QB Cam Newton. Click here to read all about it. I went to Carolina Panthers training camp Tuesday. Via National Football Authority, here are some of my thoughts on rookie QB Cam Newton as well as the other things I saw. 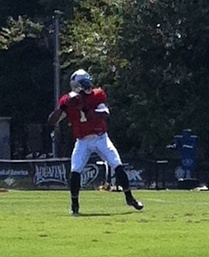 Cam Newton during drills at training camp.